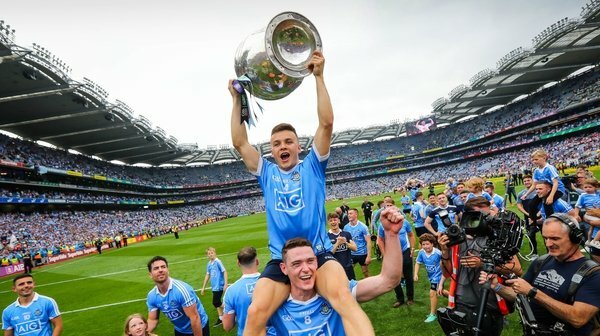 The first All-Ireland football championship in living memory without suspense ended exactly as expected - with Dublin compiling four in-a-row. There wasn’t a team to touch Jim Gavin’s imperious All-Ireland champions all year, including Tyrone in this lopsided final at Croke Park. It makes it six Sam Maguires in eight seasons, five of them under Gavin’s watch since he took over before the start of the 2013 campaign. They are certainly the greatest team of the modern era and their record will stand alongside any team past or future in Gaelic football. 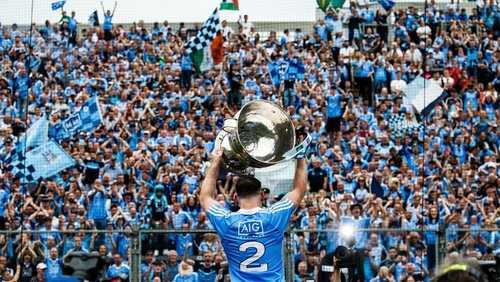 This is Dublin’s first ever four in-a-row - the only question now is who can stop the drive for five? The Boys in Blue were miles ahead of the chasing pack in 2018 and the gulf in class between themselves and Tyrone was clear to see after just 20 minutes - once they hit the front they cruised to victory slowly extending their lead as they went. Eleven Dublin players now have six All-Ireland medals and they’ll be absolutely sure that they haven’t finished their collection yet. Pretty much the only accusation levelled at a Gavin Dublin team that stuck was that they hadn’t yet delivered a complete All-Ireland final performance, winning the first four by one or two points. This was his answer. Tyrone manager Mickey Harte will rightly be judged as one of the best, an innovator and a mould-breaker, but he was outgunned completely on the line. His side got off to the start they wanted and this final absolutely needed, racing into a four-point lead on the quarter hour mark. Niall Morgan was getting his kick-outs away even when faced with 12 Dublin players in his half of the field while down at the Hill 16 end of the ground Stephen Cluxton was finding the going heavy. Eoin Murchan was turned over going for a kick-out over his head in a forest of Tyrone players and the next ball off the tee went over the sideline, both resulting in points for the Red Hand. In this time Dublin dropped two short and the normally metronomic free-taking of Dean Rock was out of time, one off the ground and one out of his hands missing the target. But this game swung on a five-minute spell midway through the first half and it coincided with the Dubs getting their full-court press right on Mogan’s kick-outs. Ciarán Kilkenny, who had been largely anonymous at full-forward from the start, but who powered into the game when he dropped out the field, forced the turnover that resulted in his team’s first goal. Paul Mannion was fouled just as he pulled the trigger, Tiernan McCann seeing yellow, and he picked himself up to convert from the spot, putting memories of his miss against Laois in the Leinster final well out of his mind. Moments later he made a vital interception in his own box, displaying the maniacal work-rate that makes him such a favourite with Gavin. Kilkenny won the break from Morgan’s subsequent kick-out from the penalty and Rock slotted over the bar. Rock scored again when Brian Fenton disrupted the very next restart. From five-one up, Tyrone trailed by 1-04 to 0-05. The improbable became the impossible eight minutes before the end of normal time in the first half with Niall Scully palming to the back of the net from point-blank range following a Con O’Callaghan hand-pass as he lay on the ground. Not long before this Dublin sweeper Cian O’Sullivan left the game, Mick Fitzsimons his replacement, with a recurrence of the hamstring injury he suffered in the semi-final win over Galway. Any flicker of encouragement this may have given Harte’s team was extinguished by the second goal. Tyrone only scored once in the final 24 minutes of play in before the break and their challenge simply seemed to run out of steam as Dublin created another problem for every solution they found. Rock scored the last two points of the half, one a free and one from play, both greeted by polite applause. Any other year the stadium would have been rocking, but there was a sense already of a done deal as the Boys in Blue went up the tunnel leading 2-07 to 0-06. Tyrone got the first two points of the second half, two minutes inside the restart, but the uprising was quickly quelled by points from Fenton and Brian Howard’s first of the day. From there they stretched away on what was essentially an extended lap of honour. Harte tried everything and emptied his bench early, but when you’re playing a better team there are no answers. Late on Peter Harte converted the second penalty of the final, Philly McMahon having climbed all over Colm Cavanagh under a dropping high ball, to claw back ground. John Small picked up his second yellow and walked right on 70 minutes, sent off in two All-Ireland finals in succession, and Tyrone cut the gap to four in the seven minutes of injury time announced. It meant excitement of sorts, though the Dubs never relinquished control. Dublin: Stephen Cluxton; Philly McMahon, Cian O’Sullivan, Jonny Cooper; John Small, Eoin Murchan, Jack McCaffrey (0-01); Brian Fenton (0-02), James McCarthy; Niall Scully (1-00), Con O’Callaghan, Brian Howard (0-01); Paul Mannion (1-00, 1-00 pen), Ciarán Kilkenny (0-04), Dean Rock (0-07, 2f, 1 ’45'). Subs: Mick Fitzsimons for O’Sullivan 26 mins; Cormac Costello for Scully 52 mins; Kevin McManamon (0-01) for Mannion 57 mins; Darren Daly for Murchan 57 mins; Eric Lowndes for Cooper 63 mins, Michael Darragh Macauley (0-01) for Rock 66 mins. Subs: Lee Brennan (0-03, 3f) for Meyler 39 mins; Frank Burns for Sludden 45 mins; Harry Loughran for McGeary (bc) 48 mins; Richard Donnelly for McAliskey 48 mins; Declan McClure for McShane 54 mins; Ronan O’Neill for Bradley 62 mins.